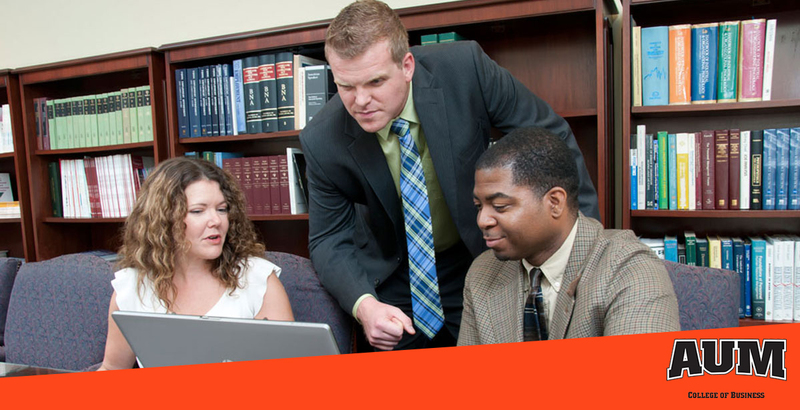 The MBA degree from Auburn Montgomery's College of Business is earned by successfully completing a 10-course program. The program may require as many as five prerequisite courses at the undergraduate level for those without a business undergraduate degree. An undergraduate degree in any field and a GMAT score is required for admission to the MBA program. The core and elective courses in the program are carefully selected based on the needs of employers, and the courses are offered in the evenings in a hybrid classroom and online format. Hybrid classes meet just once per week and are supplemented with outside assignments. Candidates seeking entry to the MBA program should plan to do well on the GMAT, make a coursework commitment, and secure funds to pay tuition and fees. GMAT Waivers now available. Ask us how. Most students take 18 months to two years to complete their MBA degree. However, completion time varies from just over one year to more than two years, depending on the number of courses students take each semester and their educational background. The number of courses students choose to take usually varies by the demands of work and family. The total number of courses students take depends on the extent of their undergraduate education in business. Students whose undergraduate major was in business are usually exempted from some or all prerequisite courses.